Does a point-and-shoot golf tournament really rev your engines? Is your favorite type of golf tournament hosted by Jim Nantz the “checked out on the Back Nine on Sunday during a final round blowout and secretly wishing he was sitting next to Tony Romo” version of him? Do you like perfectly timed rain delays to help coordinate your weekend naps? Do you love a severe lack of live television coverage from CBS that features several “moment ago” shots and putts you were already aware of because the leaderboard on your phone updated 5 minutes before? If you said yes to all of these questions, then you should absolutely love the 2018 PGA Championship at Bellerive Country Club in St. Louis. 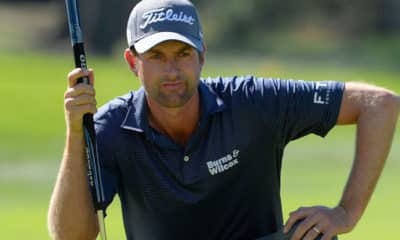 But for the rest of us who prefer a little bit more spice in their golf viewing experience, the PGA Championship at Bellerive causes the golf major season to go out like a lamb. Part of the reason that the 2018 PGA Championship lacks buzz is because of where the other majors were played this year. 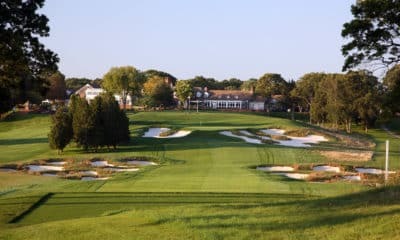 After our normal appointment viewing at Augusta, we next moved to the unique and beautiful Shinnecock Hills before heading overseas to play the legendary Carnoustie. Those are three titans in the golf world and are a favorite for the nerdiest of golf architecture fanatics out there. 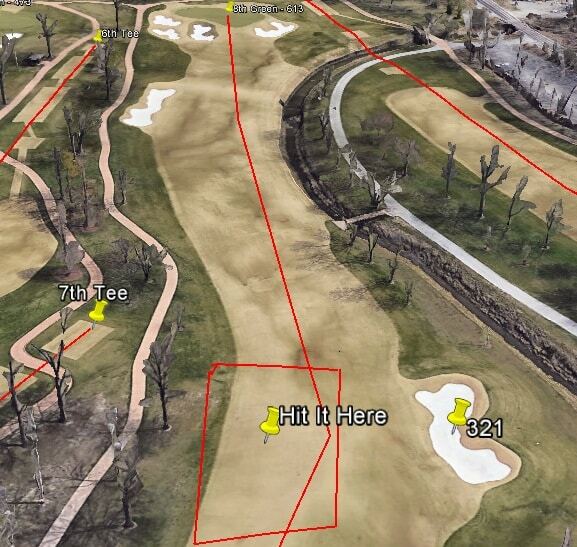 Their layout inherently encourages a more creative and exciting golf tournament. Because of the meticulous and thoughtful architectural design of these courses, it allows the viewer to watch a golfer conduct their round in a “choose-your-own-adventure” style. At a place like Bellerive, though, most golf holes can only be played one way, especially off the tee. There’s a bit of a disconnect between where the hazards are placed off the fairway and what the proper angle to the green is on most holes on the golf course. What that does is give the golfer a singular line off the tee to hit their drive, and then all it comes down to is execution. The fairway slopes towards the pond on the left side of the fairway, making any shot to that side almost certain to trickle into the water. But even if someone wanted to take it up the left side and flirt with the pond to make the hole shorter, there is virtually no benefit in doing so with their angle into the green. Not only would they have a long forced water carry into an elevated green, but their landing zone is incredibly narrow once they land on the putting surface. Instead, the best (and only) play on this hole is to hit a fade towards the middle-right fairway (or even into the shallow fairway bunker) for a great angle into the green. For the golfers who hit it 300+ off the tee, they should be able to reach this green in 2, especially with hot and humid conditions adding extra carry distance on their tee shots. 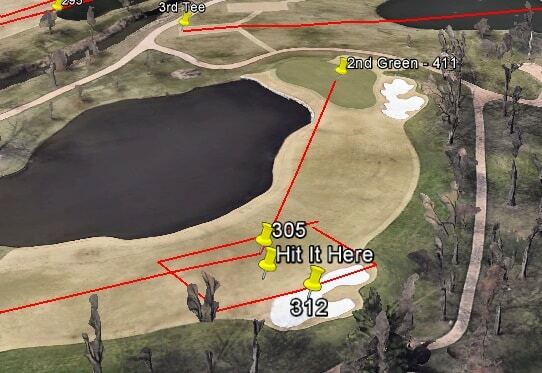 Once again, the optimal shot here is to play away from the hazard to the middle-left side of the fairway. Then they can either take a long iron and try to hit the elevated green, or they can pick and choose which greenside bunker to put their approach to give themselves enough green to work with and get up and down for birdie. This hole is supposedly the “strategy hole” on the golf course, and you may see guys attempt to drive the green if the tee-boxes are moved up. Once again, though, there is little upside to be bold because of the positioning of the hazards and the design of the green. The fringes slope away from the green, meaning that drives will either run away from the green into the rough, leak back into the pond or over the green into the creek. Instead, the prudent play is to hit a draw with a three-wood or long iron into the left fairway or rough, where a 40-50 yard chip gives the golfer a ton of green to work with to get up and down for birdie. There’s no significant advantage for anyone who wants to go for the green on this hole, which defeats the purpose of a short Par 4. But Bellerive isn’t the only problem. 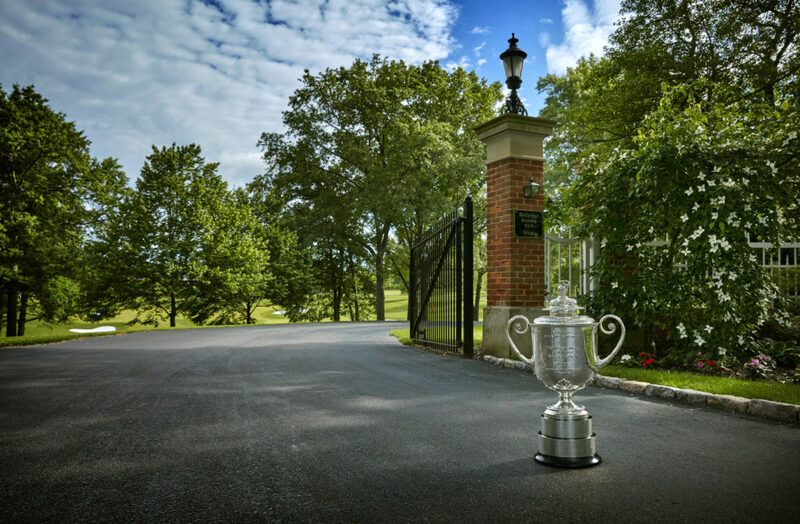 The lack of buzz of this years PGA Championship speaks more to a missing identity with the event itself. Every other major has it’s own unique identifier. For the Masters, it’s the grace, tradition and reverence of Augusta National and the unofficial start of Spring for many of us snow-buried residents of the northeast like myself. 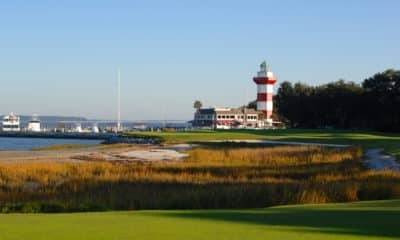 For the U.S. Open, it’s a showcase of a historic or unique golf course and seeing how badly the USGA can screw it up to create “car-crash television”. For the Open Championship, we’re brought back to the origins of golf and offers a style of play we don’t see often here in the United States. What exactly does the PGA Championship have to offer us that we don’t see every week on the PGA Tour? The golf courses they’re traditionally played on are parkland, a style that is the vast majority of most venues throughout the summer months. Plus, we were just offered a golf tournament played on a tree-lined, straightforward golf course featuring the best in the world last week at the WGC Bridgestone. This week we follow that up with…another tournament featuring the best golfers in the world on a course that plays similar? Thankfully, I happen to write for a website that encourages gambling. And if there was ever a golf tournament to take up gambling, the 2018 PGA Championship is a great place to add your own bit of excitement that the tournament may lack. Hot, humid weather: This is the final PGA Championship that will be played in the month of August, but historically the event favors strong and long drivers off the tee partially due to the weather conditions. Hot and humid weather conditions causes the ball to carry farther. That enables longer hitters to shorten up the golf course and let them take lines off the tee that normally wouldn’t be possible in cooler conditions. As temperatures are forecast to be in the low 90’s with close to 100 degree heat indexes, the ball should explode off the face of drivers this weekend. Zoysia Fairways: This type of grass is popular in hot, tropical conditions like Southeast Asia, South America and Australia. Recently, this type of grass has become popular to use on American golf courses like Trinity Forest, which hosted the AT&T Byron Nelson in May. The grass is better able to withstand hot conditions that may lack rainfall, and it grows at a slower rate than its counterpart bermudagrass. These surfaces also tend to run much slower than bermudagrass and will hinder the amount of roll off a tee shot. As such, this would tend to favor a golfer with more carry distance as that would widen the advantage a longer hitter has off the tee over a shorter hitter. Wet Conditions: St. Louis in August tends to see its fair share of pop-up thunderstorms, and as such the golf course is expected to get dumped on both before the tournament and throughout the weekend. Not only will this lengthen the golf course, but it’ll also soften up the greens and let guys go flag hunting. In fact, the golf course is so soft right now that pitch marks are being made by simple chip shots. Slow Bentgrass Greens: Typically, bentgrass greens run quick on the stimpmeter. However because they’re playing at Bellerive in August the maintenance crews aren’t able to cut the greens as fast as they’d like to without risking them browning out or losing control of the putting surfaces (it’s why Augusta National is closed during the summer). As of Monday, the putting surfaces are running pretty slow and while the maintenance crews might try and speed them up a bit, I’ll still expect them to run no more than 11 on the stimpmeter this weekend. Damp conditions both before and after the tournament also will take the fire out of them. 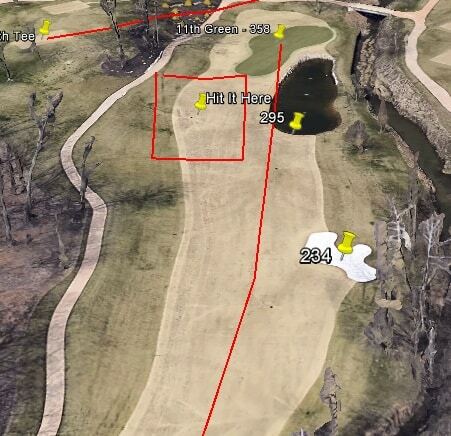 If this were 2003 where most golfers would maybe have one or two drives a round that traveled more than 300 yards, I would agree that Bellerive favors golfers with a right-to-left shot shape. 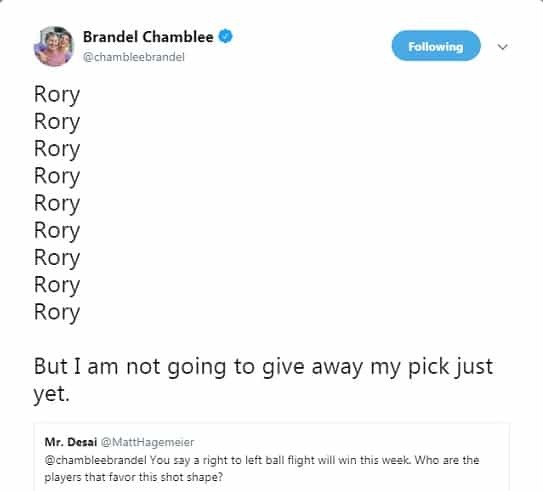 But like most of Brandel’s takes, this thinking is outdated as most of these guys are so long off the tee that they can take crazy, insane lines with their normal shot shape and be just fine for their approach. In fact, because most of the fairways on the dogleg lefts slope right to left, I might actually prefer a fader who can carry the ball a long way into the slope and better control where it ultimately settles. Strokes Gained Tee-To-Green: This stat is always important when trying to handicap a tournament, but it’ll take extra importance this week because of how soft the conditions will be. The best ball-strikers should rise to the top of the leaderboard this week. Strokes Gained Off-The Tee and Approach: Further reinforces the importance of elite ball-striking needed this week. Driving Distance: Longer hitters generally appear more often at the top of the leaderboard than more accurate hitters at PGA Championship Venues. Over the last 5 years for golfers who finished inside the Top 20 on the leaderboard, their median rank on the PGA Tour in driving distance was 55.5. For driving accuracy on these same golfers, it was 83.5. 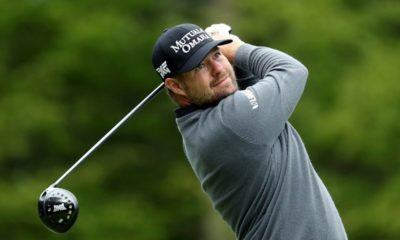 It shouldn’t be used to eliminate a golfer from consideration but it’s certainly something to keep in mind, especially if you need to break a tie between two players. Relative-to-Par Scoring: 175-200 Yards: There are several long Par 4’s at Bellerive, so most golfers should face fairly long approach shots into the green. This statistic measures how proficient a player is from this distance. Strokes Gained Putting: While I wouldn’t use this as a primary statistic, it should be used to break ties. Slower greens tends to elevate better putters up the leaderboard, and with green speeds on the slow side you could find an edge in a golfer who has putted well both on the year and historically on slow surfaces. Coming up tomorrow – winners, tournament props, and matchups you should target for the 2018 PGA Championship.